Alec Baldwin and Ben Stiller returned to the show on Dec. 1 to portray President Trump and Michael Cohen. 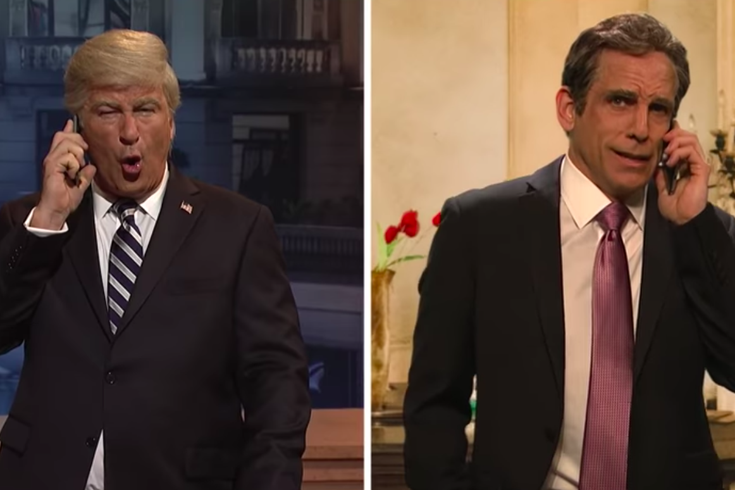 Alec Baldwin and Ben Stiller returned to "Saturday Night Live" on Dec. 1 to portray Donald Trump and his ex-lawyer, Michael Cohen during the cold open. The sketch is set at the Group of 20 summit in Argentina, where President Trump calls Cohen on the phone because he's getting nervous about the Mueller investigation. “I keep having this nightmare where I’m walking through a forest of blood,” Baldwin said. Cohen unexpectedly appeared in court earlier this week and pleaded guilty to lying to Congress during his testimony before the U.S. Senate Select Committee on Intelligence. The guilty plea reportedly involves cooperation with Mueller's investigation into Russian interference in the 2016 election. "Sorry Mr. Trump, it's over," Stiller said. "I'm sad you're going to prison, Michael. You were like a son to me," Baldwin said. "Then why did you make me do so much illegal stuff?" Stiller said. "Because you were like a son to me," he replies. Rudy Giuliani (Kate McKinnon), Vladimir Putin (Beck Bennett) and the Crown Prince of Saudi Arabia (Fred Armisen) all also made appearances in the cold open. This is only Baldwin's second appearance on the show this season after he was arrested over a parking spot dispute. In November, Baldwin was charged with misdemeanor assault and harassment over a parking spot dispute with an unidentified driver who reportedly had a jaw injury near the actor's Manhattan home. At one point, Baldwin poked fun at the incident. "God, I haven't been this upset since I flipped out over that parking space," he said.